Set sail for a day of sun and fun on the beach. Coral reefs full of exotic tropical fish surround the coastline and attract swimmers, snorkelers, and divers alike. Rent a hammock, read a book, and relax on the beach with your toes in the sand. Take a stroll down Paseo del Pescador, “The Fisherman’s Walkway,” a place where the fishermen tend to their skiffs, nets, and other gear. Explore the promenade and streets lined with shops and restaurants. Pick up a hand crafted souvenir or sip on a drink on the patio. Home to two magnificent golf courses your next stop will be to play a round of golf next to the sea. Once the sun goes down prepare for the ultimate sunset serenade. The nightlife in Ixtapa Zihuatanejo is the perfect way to bring the day to a close. Dance the night away at the handful of bars and nightclubs that are open until the early hours of the morning. If you prefer something more casual or romantic, hop aboard a sunset cruise and see why artists from all over the world come to paint the cities spectacular ocean views. You won’t want to miss all these dueling cities have to offer. 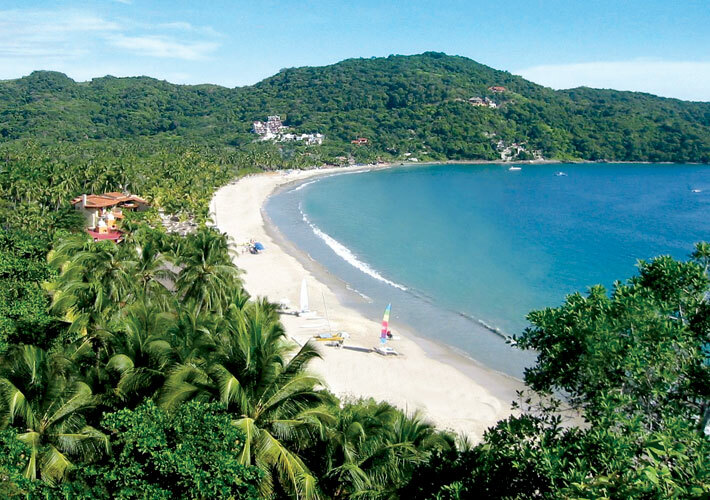 Visit Mexico’s Ixtapa Zihuatanejo and enjoy two vacations. Call today to schedule your next charter flight. Feel free to contact us at (760) 399-1000 or charter@desertjet.com, where a charter specialist will be happy to assist you and arrange all your travel accommodations.